For the past two and a half years, the Dominican Republic, which is situated next to Haiti on the island of Hispaniola, has boasted one of the strongest growing economies in Latin America and the Caribbean. According to data from the World Bank, the nation – one of the largest and most diverse in the region – has grown at an average annual rate of 5.3 percent over the past 25 years (see Fig 1). 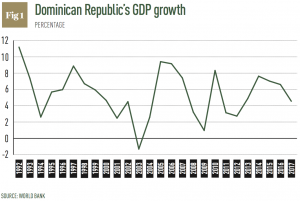 This strong economic base has allowed the Dominican Republic to achieve a favourable investment climate, as well as social and institutional stability. Together, these factors have helped spur transformative economic growth. Much of this growth is a result of the country’s financial system, proceeds from which drive resources to different productive sectors like tourism, agriculture, duty-free zones, energy and transportation. 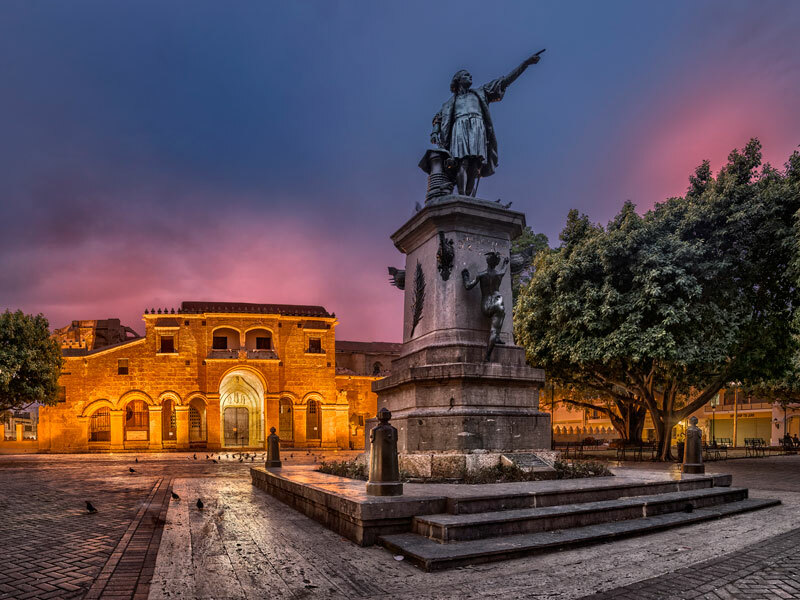 The Dominican Republic’s banking sector is one of the largest contributors to the country’s GDP development: the industry fosters the production and export of products and services through traditional financing and capital market structures. But traditional banking is transforming. Around the world, digitalisation is shaking up the business landscape for lenders, and the Dominican Republic is no exception. World Finance spoke to Arturo Grullón Finet, Executive Vice President of Personal Businesses and Branches at Banco Popular Dominicano, about how the firm is leading a digital revolution in the Dominican Republic. Banco Popular Dominicano was founded in the 1960s as an alternative to the large international banks that had settled in the Dominican Republic. Its mission was to democratise banking services in the country and support its social services to improve living conditions and benefit the wider population. Digitalisation offers banks numerous opportunities to increase financial inclusion by providing customers with better access to financial services. Digital innovations can facilitate broader financial education in the community and help provide formal credit to a greater number of people. This, in turn, can have a large impact on the economy and the productive development of the country. Banco Popular Dominicano strives to be an efficient financial service provider, but over the coming years it has plans to become much more than that. It is increasingly clear that next-generation banks must be able to reinvent themselves, placing greater importance on flexibility and digital banking. Finet said Banco Popular Dominicano will continue to respond to that challenge over the next couple of years: “Throughout 2018, we continued to distinguish ourselves from other entities of the national financial system with initiatives that add value to our different customer segments, based on a strong digital transformation model. In this regard, Banco Popular Dominicano, as the Dominican Republic’s most prominent private capital banking entity, has long been considered a catalyst for social and economic progress in the community. Banco Popular Dominicano plans to continue the progress it is making by leading the digitalisation of the banking sector in the country. Currently, more than 77.5 percent of all financial transactions carried out by Banco Popular Dominicano’s customers are performed electronically. “This figure reflects Banco Popular’s leadership regarding the financial services’ digital transformation strategy throughout the Dominican Republic,” Finet said. Through its mobile app, Banco Popular Dominicano offers customers reliable and convenient access to their financial solutions. The app meets the majority of users’ day-to-day needs and, together with the capabilities provided by the bank’s online banking model, makes banking faster and more convenient for customers. Because they do not need to visit Banco Popular Dominicano’s offices or connect to a computer to carry out a transaction, customers can save a lot of time and resources. “Our mobile application has over 450,000 registered customers. It is the most downloaded app for the Dominican financial system, and it has grown exponentially over the past year,” Finet told World Finance. Banco Popular Dominicano also provides mobile solutions via tPago, a mobile payment solutions provider created by Dominican financial services firm GCS International. On this platform, the bank has more than 556,000 registered customers. Social media is another important tool in attracting digitally focused customers. Banco Popular Dominicano continues to lead the conversation throughout the financial sector’s digital communities, with more than 642,000 followers in total. Banco Popular Dominicano has laid out three key pillars for achieving its transformative vision. First, innovation will help the company introduce new digital solutions, products and service models that meet customers’ needs. Banco Popular Dominicano’s digital centre has focused on users’ new habits and the manner in which they understand and interact with banking services. The platform will also be used to launch the bank’s innovative products and services in the future. The digital centre includes a space where customers can attend educational talks on innovation, digital culture, personal finance, industry trends and more. Additionally, it features a coworking area designed to facilitate business meetings among the bank’s SME customers, entrepreneurs and their customers or partners. “We believe that a greater acceleration of the digital banking model will occur, increasing our customers’ satisfaction, transforming our services and products, and helping us to achieve higher efficiency levels,” Finet said. This focus on technology plays into Banco Popular Dominicano’s two other key pillars for the years ahead. The second pillar will see the firm continuing to ensure that technological and operational excellence is upheld throughout the development and maintenance of new services. This, Finet said, will instil the bank’s customers with a sense of trust, as well as boosting efficiency and speed. Finally, the bank will continue to strengthen risk management and develop the skills of its employees. “Our staff allow us to have the expertise to achieve the profitable growth we seek and keep us the best company to work for in the country,” Finet told World Finance. Banco Popular Dominicano has been a catalyst for social and economic progress in the Dominican Republic for more than 54 years. In this respect, it has continued to differentiate itself from other financial institutions with initiatives that add value to the different customers it serves, fostering business growth, innovation and financial inclusion to transform the lives of many Dominicans.